Social media is alive with New Year’s resolutions this week, many of which will sadly be broken by mid-January. 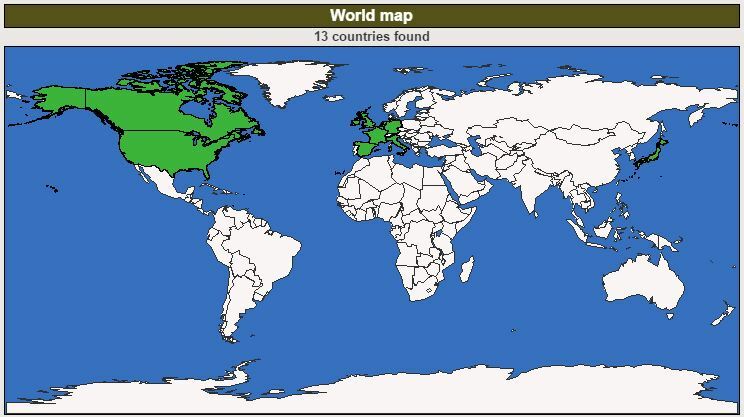 The possibilities to challenge yourself are seemingly endless for geocachers. Even if you’ve completed some challenges already, there is always the opportunity to mix it up slightly and double your efforts or use specific cache types to complete a grid. If you’re looking for some inspiration, I have put together a list of some popular challenges you could try this year below. Firstly though, a brief explanation of what a challenge cache is, in case you don’t already know. Challenges falls under the unknown cache type and are therefore denoted with a blue ? on the map. The physical cache for challenges are usually located at the posted coordinates (although some older caches may have an additional puzzle or multi element with a hidden final location), and are there to be found by anyone, but a find cannot be logged online before the challenge requirements laid out in the description are met. Groundspeak introduced some new rules regarding challenge caches last year, including the requirement for each new challenge cache to have a challenge checker, and for the word ‘challenge’ to appear in the cache name. As you may expect, challenges published before the changes may not adhere to these new rules. What makes a geocacher well-rounded? Why, qualifying for the Fizzy Challenge, of course! 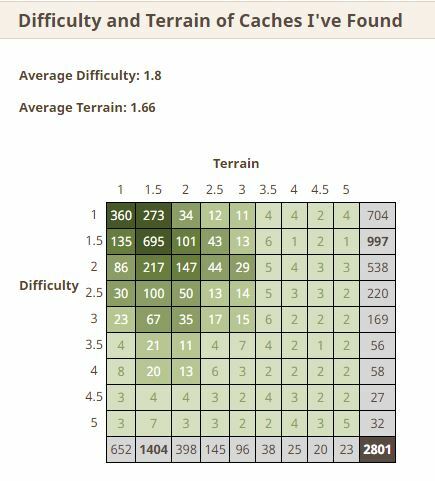 This challenge requires the finder to find at least 81 caches – one for each possibly difficulty/terrain (DT) combination, and also to find at least one of each cache type (excluding some more rare types). The Fizzy Challenge has been around since 2007 when the first version was published in California by Kealia as a way to honour fellow cacher FizzyMagic and his FindStats program. Some DTs are harder to come across than others, and you may need to travel further afield to nab those. Project-GC provides a tool called Map DT Matrix, which will identify the DT combinations you still require and where you can find them. I finished my Fizzy grid in July 2015 and it felt like such a great achievement to do it. Even if you’ve completed this challenge, you can do it multiple times; I’m now working on the second loop and have three left to fill (this is one of my own challenges for the year). 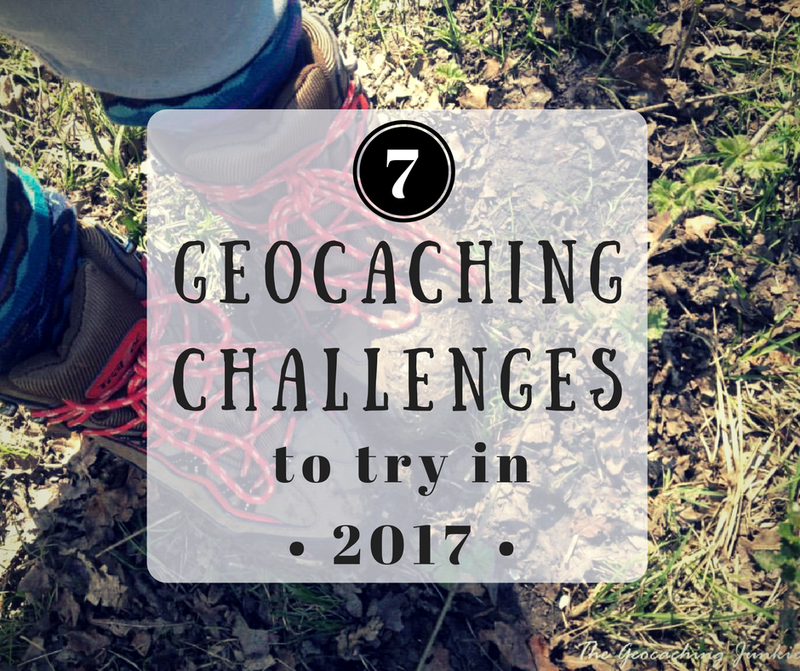 There are challenge caches out there that require you to fill the grid multiple times so the fun only ends when you decide! The Jasmer Challenge involves finding at least one cache placed in every month since geocaching began in May 2000. This is one of the ultimate geocaching challenges because it is quite tough to complete, and will likely involve some travel. The history of this challenge goes back to 2008, when geocacher jasmerb placed the first version in Northern California. Project-GC again offers a tool to identify which months are missing and where you can find them. I have 8 months from 2000 and 2001 left to find (well, 9 if you include January 2017 but I should be able to fill that one in easily enough ;)) and none left to find in Ireland so I need to travel to finish the challenge. Find a cache every day for a set period of time – most commonly for 365 or 366 days. It could be argued that this challenge is easiest if you start working on it when you’re still new to geocaching, as you’ll likely have a lot of caches to pick off more easily one day at a time. Similarly, moving to a new area can be the perfect time to start a daily streak. When I did my 404 day streak, I was somewhat lucky because I lived near Dublin, which has a high density of caches, but it still wasn’t easy, especially in winter – and we have very mild winters compared to some people! I always took it in smaller increments, 30 days at a time, “if I get to 30 days, I’ll see how I feel and keep going if I can/feel like it.” I know some people who didn’t like the pressure that comes with this challenge and it can even turn some people off geocaching altogether. That said, it is such an achievement when you get to the one year mark! As you can guess, this challenge involves finding at least one cache in every county in a given area. 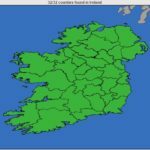 In Ireland, we have just 32 counties but in other countries, there are many, many more, making this challenge a lot more difficult. What’s nice about this challenge is the different places you see and experience as you tick all the counties off your list. Project-GC has a handy county mapping function too so you can figure out where you need to find caches. Travel is one of those things that goes really well with geocaching, as local cachers are your guides to the best spots and hidden gems in their home villages, towns and cities. Obviously, not everyone is lucky enough to have the means to travel extensively, and some people don’t really have an interest but if you are able to travel and enjoy doing so, there is little more satisfying than visiting a new country or state. 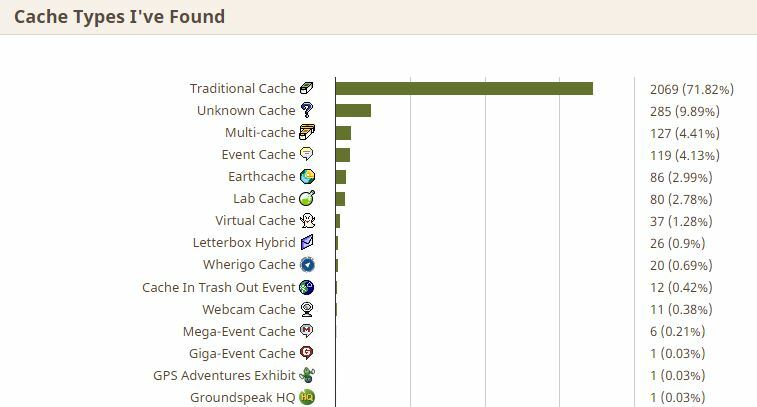 There are currently 16 cache types* to be found but how many can you find in a day? My personal record is 10 and I did this the day following the 2015 UK Mega in Essex. The way to maximise cache types is to find an area where a lot of the types already exist. Cachers often travel afar for mega events and this opens up an opportunity to maximise cache types in a day. *Traditional, multi, mystery, EarthCache, letterbox hybrid, event, CITO, mega, giga, Wherigo, Geocaching HQ, GPS adventure maze, lab cache, virtual, webcam, Project A.P.E. Another one of those pesky grids to fill in! This one involves finding a cache placed on each and every date of the year. 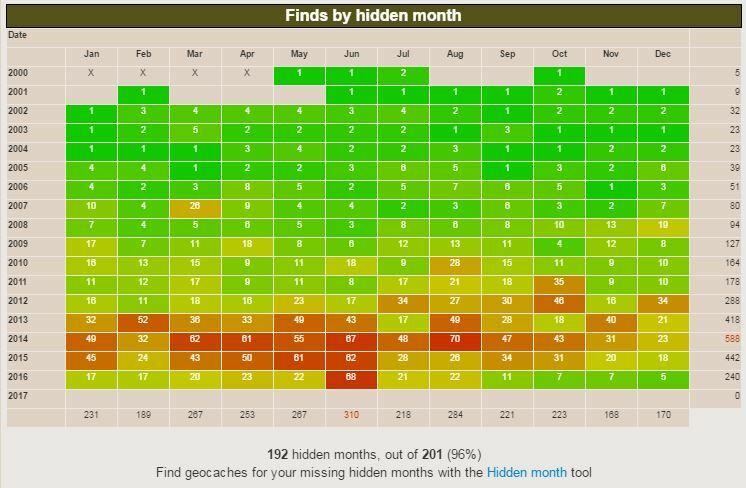 The more caches you’ve found, the more likely it is you’ll have filled out the majority of dates without even trying. There will likely be a few random dates that are inexplicably more rare and therein lies the challenge. These are just a small sample of the types of challenge you can set yourself, and you don’t need to have a specific challenge cache in mind to set yourself a goal. If you do want to work towards a challenge cache in your own area, or somewhere you’re travelling to, Project-GC has a tool that searches for challenge caches in specific areas, which is really useful! Don’t forget you can find and sign the log on a challenge cache before qualifying, but can only log online once you have met the stipulated requirements. Which challenges do you have on your list to work on this year? Have you already completed any? Let me know in the comments! Thanks for another great blog. I was inspired by your previous one and have set my own challenges. One is to get my total number of finds to 1,000 although I think this is a bit ambitious. 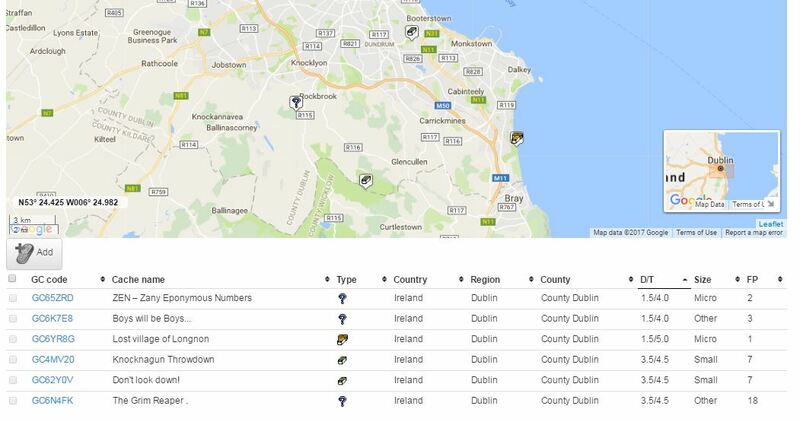 Also want to find caches in each of the counties of Ulster, aiming for the rest of Ireland at another time. Like you, looking for other cache types, did a multi at the beginning of the week. Saw on a log by cep99 about Project GC, hadn’t a clue what it was although I doubt whether I’ll find a challenge for me as am unlikely to go above a T3. Thanks again for the blog. I have decided that my personal 2017 challenge is to maintain an average of 2 cache finds per day. This will be checked on the last day of every month. So for January, I need to have 62 finds. For February, I need 56 finds. And so on. It doesn’t mean I have to go out every day, just that by the end of each month, my average finds per day in 2017 is at least 2.0. This should help me avoid months like last year where I had as few as 6 finds in a month! My personal challenge is to find all caches in a 5 mile radius. We have been working on it for a while but are giving it a good go this year. Problem is new ones keep getting published and there are a few pesky puzzle caches we’ve not solved yet. Excellent blog as usual. We cache as a family and have each set our own geocaching goals for the year and have a combined one as well. My wife wants us to be able to finish the county challenge foe our state (Colorado). We are roughly halfway through the list and may be able to finish this year with some well planned travel. My youngest want to hide her first gadget cache and my oldest wants to hide a D5T5 geocaching challenge. For me, my current goals is to reach my 175th D5T5 find. It will take some travel and guts but should be fun. The one last goal we want to accomplish is to finish our Jasmer Challenge. We only have one month left and should be able to get that smiley next week. Fingers crossed. Thanks again for the blog – I really believe challenges add an additional aspect of fun to our game. Sounds like a lot of fun geocaching times ahead this year – amazing to finish the Jasmer Challenge! I’m down to 5 months but I don’t think I’ll finish this year, need to do a bit more specific travelling, maybe next year 🙂 Thanks for reading! Whew! Great challenges, but not sure I’m up for them just yet. Haha. 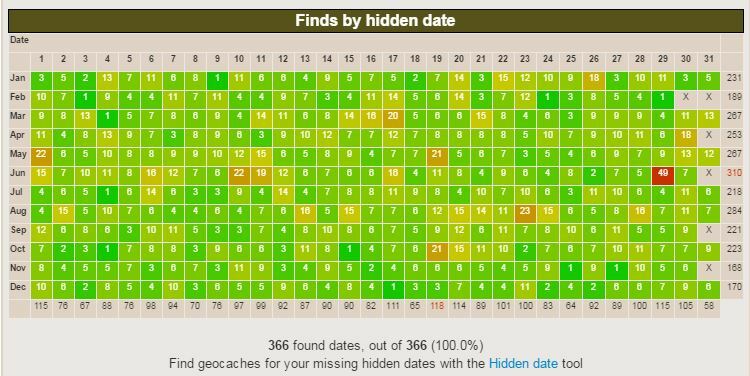 I set the goal of finding 100 geocaches in a month’s time for the Hidden Creatures challenge but only found just under 40 caches…so I missed out on the dragon and the turtle!